In 2001 The Victoria & Albert Museum unveiled their new British Galleries in which the Great Bed of Ware, now refurbished, was given due prominence and the Poet Laureate, Andrew Motion, wrote a poem about it. 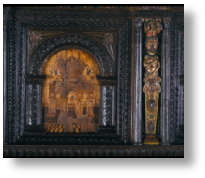 The Woodwork – The posts with their complex carved patterns would have been very fashionable in the 1590’s, as would the inlaid patterns on the headboard. This kind of inlay was a speciality of Southwark, London, where German or Dutch Joiners had settled and established workshops. Panels showing swans show a connection to Ware, a symbol connected with the town. The carved figures on the headboard are large scale and intended to have an immediate impact. The coloured paintw ork was bright and together with the black and white marquetry, would have appeared gaudy by today’s standards. The Bed has been altered more than once. An engraving in the 19th century shows a different frieze round the top. 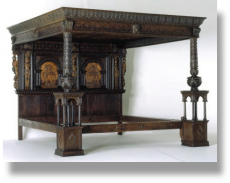 Three ‘settles’ or planks exist which were once attached to the sides of the bed, though these are not thought to be original. 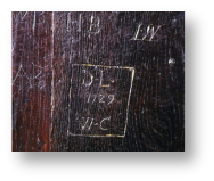 The status of the Bed as a rarity and relic to be visited is shown by the graffiti carved into it together with seals in red wax. INew Hangings – The best information on how the han gings may have looked comes from inventories around 1600. It is possible to narrow the research to inventories of houses of a particular social range, including inns, as well as geographical area. Southern England showing a combination of red and yellow was most popular. It is not known how ‘special’ the Bed was so it has to be assumed the hangings were of high quality together with the bedding but nothing beyond what was listed in inventories of inns and ‘middling’ households. 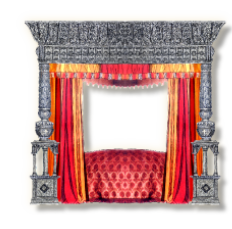 Beds were highly important items of furniture and their hangings frequently cost more than the frames. Ironwork - No old mechanism for hanging curtains existed on the Bed except for two hooks. New hanging rods and hand-forged rings to hang the curtains were made by a blacksmith, These were carefully designed to be attached without making new holes in the old woodwork. Roping - The first layer of the Bed was hemp rope. The original holes were used. Bedmats – 16th century households laid bedmats on the ropes to give a firm base for the mattresses. Bedmats were made of plaited rushes. The new mats (two to cover such a large bed) were made to the traditional pattern. Mattresses – Three have been provided. The originals would have been filled with woollen flocks or unspun wool (lowest), feathers (middle) and down (topmost). In the reconstruction these have been filled with inert polyester because of the danger of infestation. One mattress is covered in stripped ticking of a period pattern. Two are covered in plain canvas. Both kinds of fabric appear in 16th and 17th century inventories. Sheets – Two plain linen sheets have been woven to the narrower handloom widths and sewn together with all hems and visible stitching done by hand. Bolster, Pillows & Pillowcases – A bolster and eight pillows in striped ticking to match the mattress and filled with inert material. Four pillows have plain linen cases and four have cases embroidered in blackwork. Blankets – The Bed has two woollen blankets woven to a narrow width and seamed. They are in a twill weave. At the top end they show woven blue stripes. This was traditional in the 16th century and remains as a decoration for blankets to this day. 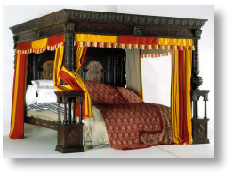 Quilt – 16th century beds often had a quilt as a major showpiece of textile. The Great Bed’s is in ‘shot sarcenet’ a taffeta type of silk. This type of silk is often mentioned in inventories of the 16th & 17th century. The pattern was taken from a 16th century quilt. The two colours are pink and green, one of the most recorded colour combinations. The wadding was again made from inert material. Counterpane – This was always an area for display of luxury. 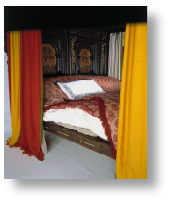 The counterpane for the Great Bed is in a patterned fabric woven with an unbleached linen warp with a weft of wool, alternating with gold thread, following the pattern of a 16th century textile.